This design dates back to the 1960’s. It was brought to Dartington by the very famous Frank Thrower MBE. Frank was an icon in British Design and a key figure behind Dartington’s early success being its chief designer and co director. Since the very beginning of design in Devon he was a major inspiration for style creation. During his lifetime Frank created over 500 designs for Dartington many of which were acclaimed. Sadly he died of cancer in 1987 but some of his designs are still in production today including the very popular Dimple range. 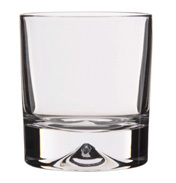 The Dimple Glassware is a selection which simply has a dimple to the base – imagine a thumb being pressed into the bottom to create an indentation so when viewed from the side profile you can see the real beauty and simplicity of this design. 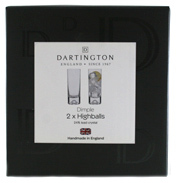 Each piece of Dimple glass is made by hand at Dartington’s factory using only the finest crystal. This modern classic has a solid design with a weighty feel to give the user a sense of quality. The heavy base means the glasses are a pleasure to hold making these true glasses to be held and enjoyed. The range is limited to key pieces which they have done well. They have elegant, clean lines suited to both the traditional and contemporary home. Dimple has timeless appeal and is still as popular today as it was originally, much helped by its contemporary looks – way ahead of their time in the 60’s. 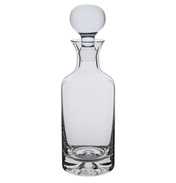 Your collection is not complete without a Dimple decanter and glasses. To appreciate any special drink the glass needs to look and feel right. A good whisky can only release its full taste potential when properly presented. Imagine a malt whisky served on the rocks in Old Fashioned Dimple or the Double Old Fashioned Dimple glass for the larger measure and to allow flavours to develop. 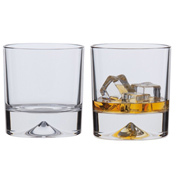 The ‘old fashioned’ shape was one traditionally used to serve Cognac, Brandy or Whisky together with Soda water, Cola or Tonic as a mixer, although the Dimple Highball shape is also perfect for this use. The beautiful clear glass of Dartington allows the colour of the spirit to shine through allowing you to enjoy its colour to the full. 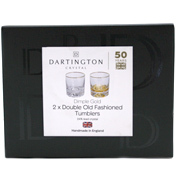 Up the profile of your favourite tipple by using one of these Dimple tumblers to make your drink feel even more special. Functional, yet innovative design brought to you by Dartington’s Frank Thrower.